SEOUL/PAJU -- North Korean athletes and officials at the PyeongChang Winter Paralympics returned home Thursday after participating in a winter Paralympic Games for the first time. The North's 20-member athletic delegation and four-member team of National Paralympic Committee officials crossed the border at 1:50 p.m., according to a pool report. With smiles on their faces, the North Koreans did not answer at a border checkpoint when asked by pool reporters about how it was to participate in the Paralympics. The North Koreans came to South Korea on March 7 via a land route for the March 9-18 Paralympics in South Korea. North Korea sent six athletes, including sit skiers Kim Jong-hyon and Ma Yu-chol, to the Paralympics. But four among them, including one 9-year-old athlete, took part in the Games only to observe competitions. 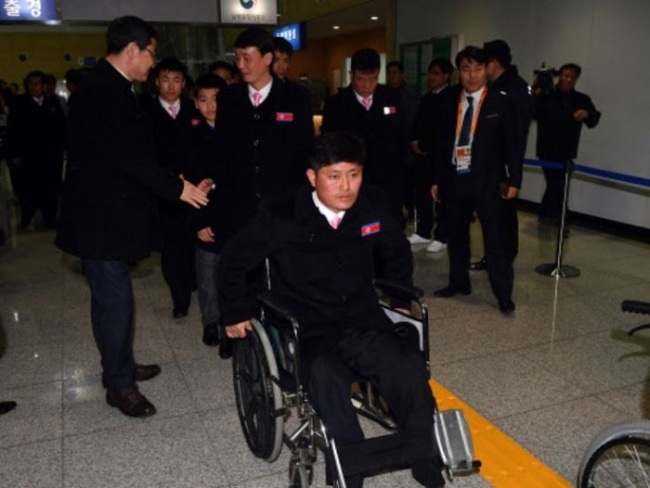 Jong Hyon, a vice chairman of the central committee of the Korean Federation for the Protection of the Disabled, led the athletic delegation that included six athletes. Kim Mun-chol, chairman of the KFPD, represented the four-member NPC delegation. North Korea's participation in the Paralympics is part of a flurry of sports diplomacy between the two Koreas after a year of heightened tensions over the North's nuclear and missile provocations.